The diagnosis of diseases originating in internal organs mostly depends on biopsy samples taken from affected regions. But collecting such samples is extremely error-prone because of the inability of existing endoscopic imaging methods to accurately picture sites of disease. The conventional optical elements in catheters used to access difficult-to-reach areas of the body, such as the gastrointestinal tract and pulmonary airways, are susceptible to aberrations that hinder the full capabilities of optical imaging. Currently, specialists in endoscopic imaging at Massachusetts General Hospital (MGH) and pioneers of flat metalens technology at the Harvard John A. Paulson School of Engineering and Applied Sciences (SEAS), have come together to create a new class of endoscopic imaging catheters—termed nano-optic endoscopes - that overcome the confines of existing systems. The study is described in Nature Photonics. Clinical adoption of many cutting-edge endoscopic microscopy modalities has been hampered due to the difficulty of designing miniature catheters that achieve the same image quality as bulky desktop microscopes. The use of nano-optic catheters that incorporate metalenses into their design will likely change the landscape of optical catheter design, resulting in a dramatic increase in the quality, resolution, and functionality of endoscopic microscopy. This will ultimately increase clinical utility by enabling more sophisticated assessment of cell and tissue microstructure in living patients. To show the imaging quality of the nano-optic endoscope, the scientists imaged swine, fruit flesh, and sheep airways, and human lung tissue. 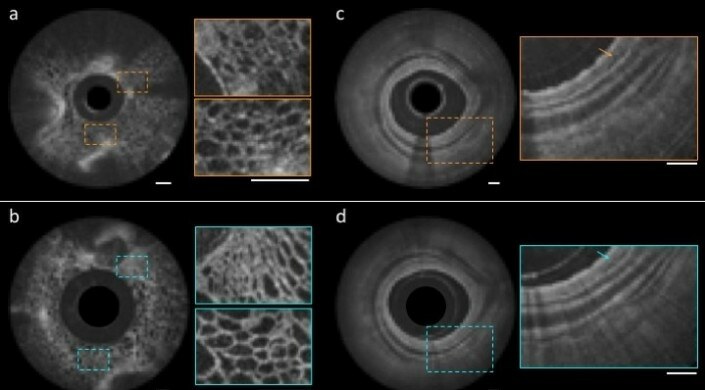 They demonstrated that the nano-optic endoscope can image deep into the tissue with considerably higher resolution than provided by existing imaging catheter designs. The images taken by the nano-optic endoscope evidently display cellular structures in fruit flesh and tissue layers and fine glands in the bronchial mucosa of sheep and swine. In the human lung tissue, the scientists were able to unmistakably identify structures that correspond to fine, irregular glands specifying the occurrence of adenocarcinoma, the most prominent type of lung cancer. Subsequently, scientists aim to search for other applications for the nano-optic endoscope, including a polarization-sensitive nano-optic endoscope, which could contrast between tissues that have very-organized structures, such as collagen, smooth muscle, and blood vessels. This paper was co-authored by Mohammadreza Khorasaninejad, Vivien Ding, and Alexander Zhu, SEAS; Lida P. Hariri and David C. Adams, MGH; Zhujun Shi, Harvard University; and Cheng-Wei Qiu, National University of Singapore. The study was supported partly by the National Institute of Health, the Air Force Office of Scientific Research and the LUNGevity Foundation/Upstage Lung Cancer.